Here's a little something I made last night - I seemed to get a second wind later on day after having been super tired and cranky all day! It's a little bird collage on a vintage book cover. 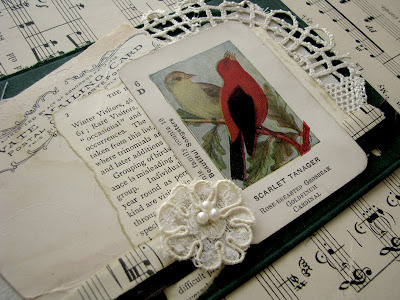 The book cover base is layered with muslin and lots of vintage items - lace, a postcard, book page, bird card, seam binding and sheet music. I adhered the muslin to the book cover with iron-on fusible webbing and the paper elements with gel medium. I used fabric glue to attach the lace and seam binding and some heavy gel medium for the lace flower. I'm busy working on a new project for my Etsy store - some beautiful themed kits and these are some of the items you might in them! I'm working on a fabric journal today. Head on over to the Facebook page for a peek and to share what you're working on this weekend! I get a wild stint at night too. 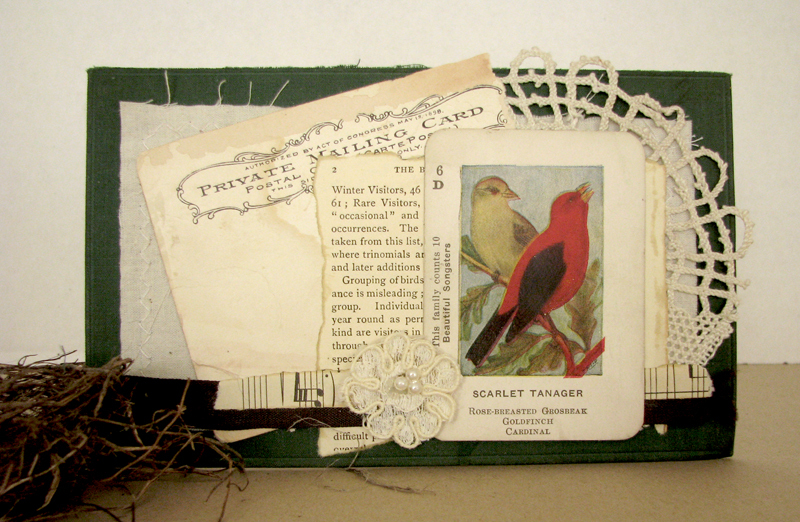 I just love collaged pieces and birds are a favourite too. I love the dark background, layers of paper and lace - and the fabulous pop of colour from the two birds! Thanks so much for sharing with My Mojo Monthly! Very sweet, I do love spring! Lovely, Ali, and it even uses one of my favorite subrates, an old book cover! It's a beauty, gorgeous creation! Beautiful Ali - I love the vintage lace!! love your style and these incredibly beautiful materials that you're working with! Lovely cover Ali - love all the layering and the birds are beautiful. A vintage delight. Wonderful elements brought together. It is funny as my recent post also makes use of a book cover. This is beautiful, I love the image of the bird and how you've put everything together. Thanks for joining in with our Shabby Vintage theme at the Craft-Room Challenge and good luck. Wow, this is gorgeous! Love that bird and the doily is such a delicate touch! Have a great Tuesday! How pretty! I love the gorgeous flower on the front- looks like it is from a Vintage wedding dress.... The vintage image of the birds is great - love the ephemera you used too. Very stunning vintage looking collage! Those birds are so pretty! This is beautiful, I love it. Thank you for joining us at Craft-Room Challenge.